The State’s general operating revenues for fiscal year 2018 were $37.7 billion, according to a recent report by the General Assembly’s Commission on Government Forecasting and Accountability (COGFA). The figure is $961 million, or 2.6%, above the forecast of $36.8 billion presented by the Governor’s Office of Management and Budget (GOMB) in February. 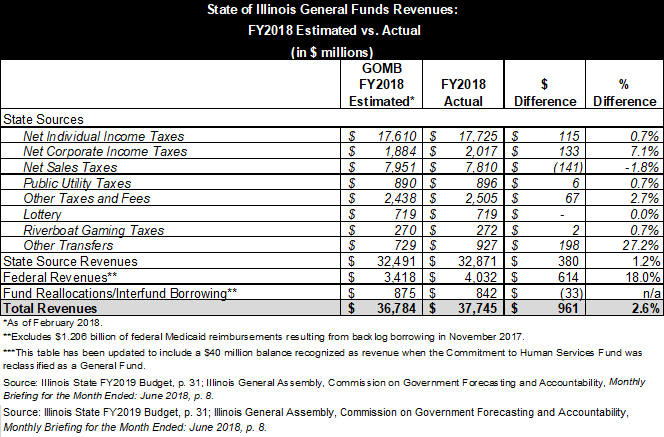 The following chart compares actual General Funds revenues in the fiscal year that ended on June 30, 2018 with GOMB’s projections. COGFA’s FY2018 revenue forecast was similar to GOMB’s at $36.9 billion. Federal revenues of $4.0 billion exceeded projections by $614 million, or 18.0%. The federal component of General Funds revenues relates mainly to reimbursements for State Medicaid spending. Budget officials said the federal revenue increase was largely a matter of timing: because the State paid more Medicaid bills before the end of the fiscal year, more matching federal payments were received and booked in FY2018 instead of in FY2019. It should be noted that the federal revenues shown in the table above do not include $1.2 billion of Medicaid reimbursements due to bonds sold in November 2017 to reduce the bill backlog. The State also brought in more income taxes than expected, which has been attributed to federal tax changes. Corporate income taxes (net of amounts diverted to pay tax refunds) of $2.0 billion exceeded projections by $133 million, or 7.1%. Net individual income taxes of $17.7 billion were $115 million, or 0.7%, above GOMB’s forecast. Transfers were above projections, largely due to $198 million in additional payments from the Capital Projects Fund to reimburse General Funds for capital purpose debt service costs. Sales tax receipts of $7.8 billion were $141 million below forecast amounts. Total General Funds revenues of $37.7 billion include $269 million in fund reallocations and $533 million in interfund borrowing authorized by the FY2018 budget. About $128 million of the interfund borrowing had been repaid by the end of the year, according to the COGFA report. Cash balances totaling $40 million in the Commitment to Human Services Fund were recognized as revenue when that fund was reclassified as a General Fund in the FY2018 budget. 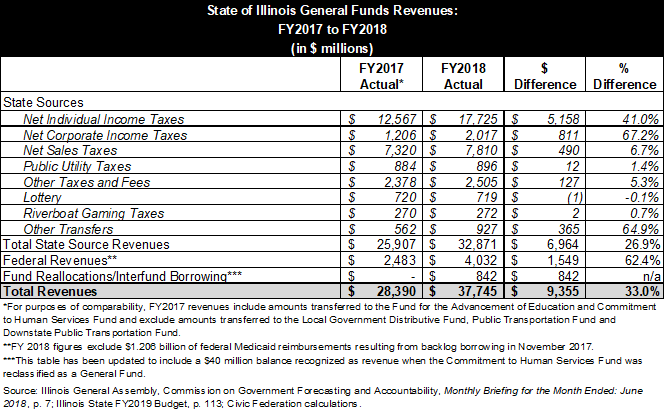 Mainly because of income tax increases that took effect on July 1, 2017, General Funds revenues increased by $9.4 billion, or 33.0%, in FY2018 from $28.4 billion in FY2017. Individual income tax rates were raised to 4.95% from 3.75% and corporate income tax rates were raised to 7.0% from 5.25%. The next table shows General Funds revenues in FY2017 and FY2018. As in the previous table, the FY2018 total includes $842 million of fund reallocations and interfund borrowing. Federal revenues were depressed in FY2017 as the State’s cash flow problems led to delayed payment of Medicaid bills. Absent other changes, the additional revenues in FY2018 would be expected to permit the State to pay down more of its year-end obligations. Although the FY2019 budget included $1.2 billion in supplemental appropriations for the previous fiscal year, most of the spending had already been accounted for in the projected backlog. In April 2018 bond documents, GOMB estimated that the backlog would stand at $7.7 billion at the end of FY2018. The actual backlog as measured by the Illinois Comptroller’s Office was $6.3 billion on June 29, the last business day of the fiscal year. The Comptroller’s Office will have a more precise number later this month, when it releases the Debt Transparency Act report for June 2018. However, at least some of the backlog reduction in FY2018 might be offset by an increase in FY2019. If federal revenues were higher than expected in FY2018 because Medicaid bills were paid more quickly than anticipated, then those revenues will be deducted from projected FY2019 receipts. This blog post was updated on August 3, 2018 to include a $40 million balance recognized as revenue when the Commitment to Human Services Fund was reclassified as a General Fund.